As a reviewer, in my own (admittedly limited) experience, I've found that the hardest reviews to write aren't about the series that I hated, or the series I was indifferent towards, but the series that I really liked. And not because I'm short on words, or can't work in humor in a way that I like, but because, really, it's hard to write a positive review that doesn't end up reading like a badly-disguised advertisement. Of course, to a degree I suppose that's what a positive review is; it encourages people to go out and get something. Even so, I've always had this nagging instinct to restrain myself from being too enthusiastic, lest I start to sound like a bad salesman. But you know what, in this case? Screw it. Air is great, and you should watch it. Air was originally a visual novel published by Key and adapted into a 13 episode anime by Kyoto Animation (the same studio behind Full Metal Panic! and The Melancholy of Haruhi Suzumiya). The anime follows a young traveling puppeteer named Yukito, as he comes to a quiet town on the coast. Here he meets a number of the town's inhabitants, most of whom happen to be high school girls. At this point, Air seems lightweight enough: it could easily be summed up with "guy walks around talking to cute girls," and looks more like the beginning of a harem anime than anything else. Do not be fooled by this easygoing start, however - Air is anything but "light." Initially, Air splits its focus between three of the high school girls. However, two of these girls end up with small, self-contained story arcs that don't really seem to add too much to the story. Both of them are entertaining, yes, but they don't seem to add anything to the real focus of the story: Misuzu's arc. Misuzu is a cheerful yet lonely girl and is the first person in the town that Yukito meets. 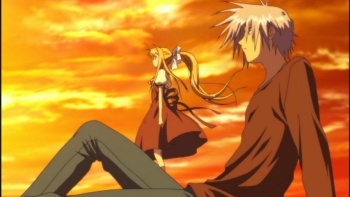 However, as the two grow closer, Yukito discovers why Misuzu never seems to be able to make any friends: Every time she gets close to someone, she starts to have a mental breakdown. And as Misuzu starts to grow weak and sickly, Yukito realizes that Misuzu is remarkably similar to a girl his mother had been searching for; a winged girl who was fated to die young and alone. Each of these arcs combine elements of drama, tragedy, comedy, and romance, and it can get a little overwhelming at times. And if you think this qualifies as a plot rollercoaster, all of the above happens within the first seven episodes. If you're familiar with other Key visual novel-based anime, then you probably know to expect an element of fantasy. Nowhere is this more apparent than in the next arc (yes, there's more), a sequence that pulls the setting back to a thousand years ago, where a samurai named Ryuya and an attendant named Uraha help a truly winged-girl named Kanna to escape a life of imprisonment in a shrine. While the previous arcs present the viewer with a jumble of confusing ideas and plot elements, the flashback arc manages to tie all of these elements together in a way that not only works, but made me go "Oh wow," as I started to connect the dots and see the strings that tied all of the plot elements and arcs together. It is a truly skillful show of storytelling, and it clears all of the confusion as it drives the series into its final, climactic arc. The production quality of Air can only be described as "excellent." Visually, the series is top-notch, with animation that one might expect to see in a film. But what really stands out about Air is its soundtrack. Whereas many anime series tend to leave music as an afterthought, Air takes the opposite approach. The series is full of exceptional scores, most of which were composed especially for either the game or the visual novel upon which it is based, and all of a quality that is rarely found in an anime series. The Air Complete Series DVD set that I received for review is notably missing the thirteenth and final episode of the series. However, "final" here is something of a misnomer, because as I understand it, the thirteenth episode was simply a recap episode of the last arc, which concludes with episode twelve. In addition to the full series, though, the set contains two additional episodes, collectively titled Air in Summer. These two episodes accompany the flashback arc, filling in scenes and fleshing it out a bit more. While entertaining, Air in Summer mostly consists of lighthearted humor, and while entertaining, isn't really necessary to the completion of the series. Really, Air is a rare feat. While many anime series can spend hundreds of episodes tying up plots, Air manages to pack an incredibly complex story into only twelve. While it may seem overwhelming at times, by the end of the series, all of the plot threads tie together into a single, complete, and immensely entertaining drama. Bottom Line: An anime like Air doesn't come very often. Equal parts drama, tragedy, romance, comedy, and fantasy, Air manages to tie all of those elements together into one unforgettable story. It isn't something that should be missed. Recommendation: Unless you suffer from some sort of rare mental condition that prevents you from watching anything that isn't chock full of action and exploding heads, I can only offer this advice: Watch this series. Josh Viel is a freelance writer and really, really, really wishes that there were more anime with soundtracks as good as Air's.